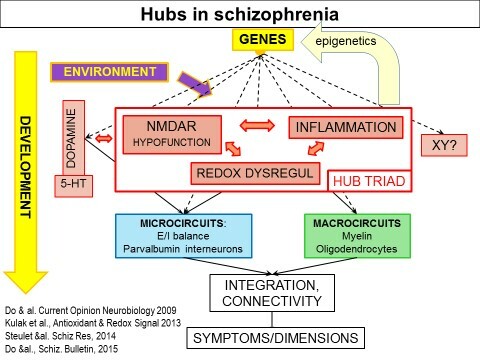 The URS team worked out the hypothesis – based on the results of its studies and on scientific literature – that an imbalance between free radicals and antioxidants (called redox dysregulation) in nerve cells plays a key role in the development of schizophrenia; it has also an essential influence on the outbreak of autism and bipolar disorders. This imbalance is caused by the combination of genetic and environmental risk factors and leads to particularly harmful consequences during the development of the brain, i.e. between pregnancy and puberty. Childhood and adolescence are thus critical periods regarding the occurrence of biochemical anomalies leading to the disease; early intervention therefore plays a crucial role in the development of these disturbances. Genetic factors linked to redox dysregulation involve in particular the metabolism of glutathione, a powerful antioxidant which is essential for the elimination of toxic substances in the human body (produced in particular by the absorption of oxygen). Environmental factors can be manifold and of physical (complications at birth, infections, viruses, drug addiction, etc.) or psychological origin (trauma, stress, abuse, grief, etc.). The result is an “oxidative stress”, which inhibits the normal development of a particular type of neurons and of nervous connections in the brain. Experimental evidence (in animals or cell cultures) shows that an imbalance between oxidations and reductions leads to consequences very similar to the anomalies observed in patients. Brain anomalies identified in patients are related on one hand to a particular type of inhibitory neurons, called parvalbumin interneurons (PVI), which play a key role in the microcircuits of the cortex and for all cognitive functions, and, on the other hand, to the cells responsible for the formation of myelin (called oligodendrocytes); myelin is the protective envelope of nervous fibres, which connect the different parts of the central nervous system, and make up the macrocircuits of the brain These anomalies are most probably responsible for the various manifestations of the disease, including sensory, cognitive, affective and social disorders as well as hallucinations. Cognitive disorders involving memory, attention, concentration and the ability to plan actions are heavily disturbing for the private and professional life of patients. This basic c oncept was continuously developed thanks to the expertise of the URS and its collaboration with other leaders in the field. Indeed, it has been confirmed that redox dysregulation is closely linked to various mechanisms, which involve in particular: (1) a dysfunction of the immune system leading to the inflammation of the nervous tissue, (2) a dysfunction of the glutamate receptor “NMDAR” and (3) an imbalance of the transmitter substance dopamine. Indeed, the excess of oxidations in the brain leads to an inflammatory response and, conversely, inflammation favors oxidative stress. These two phenomena thus reinforce each other in a positive feed forward process, leading to deleterious consequences. The same worsening reciprocal interaction is observed between oxidative stress and the NMDAR receptor, one of the most important brain receptors which plays a key role in all learning and memory processes: oxidation leads to a reduced activity of the receptor, which in turn leads to an insufficient activation of antioxidant defense mechanisms. Finally, dopamine degradation generates multiple oxidizing substances. 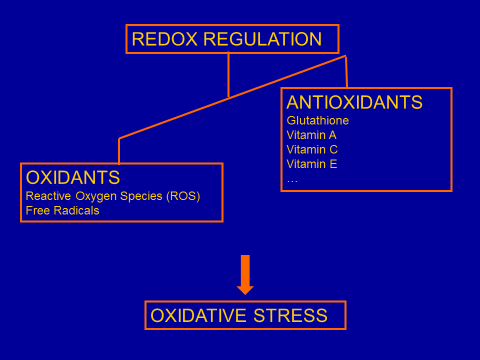 Each of these vicious circles keeps itself going, and they mutually increase the level of oxidative stress. Hence these four factors, inflammation, NMDAR hypofunction, redox dysregulation, and dopamine imbalance, all involved in the disease, converge on oxidative stress and mutually amplify their negative effects. Future preventive treatments in case of juvenile insults/trauma will thus probably consist in trying to counter these factors during brain development through combining antioxidants, anti-inflammatories, NMDAR activators and antipsychotics. There are many animal models based on various genetic or environmental anomalies, which are used in different laboratories, and which all replicate certain aspects of schizophrenia or autism. 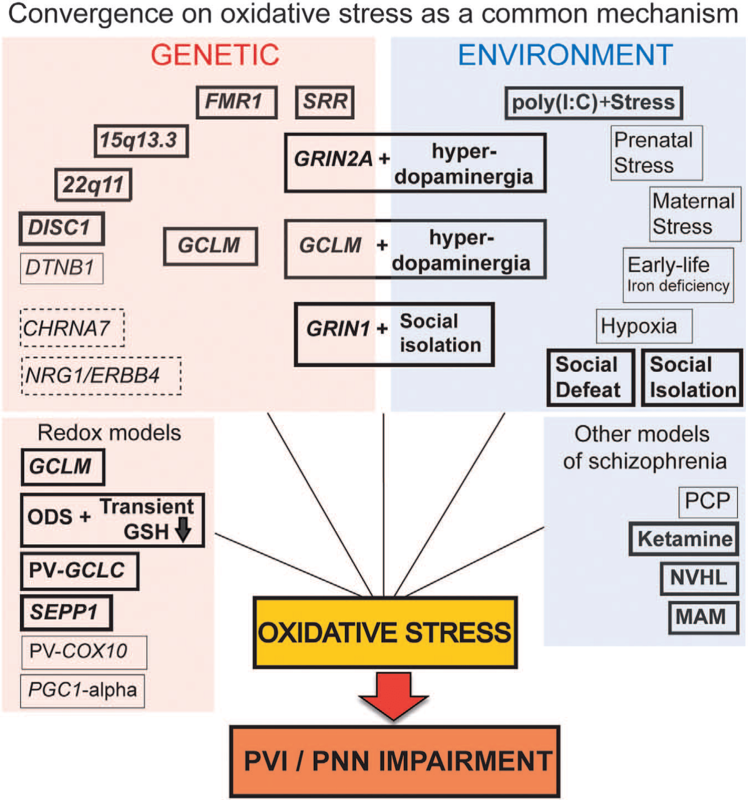 The URS has studied these other models, and has reached the conclusion that nearly all of them are subject to oxidative stress, in particular if they are exposed to environmental stress during the development of the brain. This oxidative stress is linked to anomalies of parvalbumin interneurons, and is most probably responsible for these anomalies. Indeed, in cases in which it has been tested, it was shown that the administration of an antioxidant not only reduces oxidative stress but also restores parvalbumin interneurons and their function. Thus it seems that various mechanisms, either of genetic, environmental or combined origin, finally lead to oxidative stress, which disturbs the normal functioning of parvalbumin interneurons; these interneurons are highly important for all cognitive functions. These results suggest that a great number of causal agents converge on oxidative stress, which therefore takes on a more general importance than initially proposed by the URS. The URS has conducted two major and very promising clinical trials with an antioxidant called N-acetyl-cysteine (NAC), which provides the main component for the synthesis (production) of glutathione, and thus allows to fight against oxidative stress. Patients who participated in the trials received NAC in addition to their standard treatment. They were randomized, double-blind, placebo-controlled trials lasting for a period of 6 months per patient; this means that half of the patients participating in the study received NAC, the other half took a placebo (neutral substance); the distribution was carried out randomly, and the study was conducted simultaneously in both groups. The first trial, which was conducted between 2002 and 2005, focused on chronic patients, who experienced an improvement of their symptoms, in particular their negative symptoms (language, communication, emotional and social deficiencies), which are not modified by presently available medication. No negative side effects were observed. In addition to clinical improvements, it was also observed, by means of electroencephalography (EEG), that the exploiting of auditory information by the brain is improved – a change that no other medication tested to this day has ever produced. The EEG recordings have furthermore shown that NAC improves the neuronal synchronization at rest, which corresponds to the improvement of disorganization symptoms in patients. These results prompted a trial with NAC in young patients in the hope that the effects might be even better given the fact that young patients do not (yet) show damages due to the chronicity of the disease. Researchers from Harvard University (USA) wished to join the study. Patients treated with NAC showed an improvement of their cognitive symptoms, in particular the speed of information processing, which is of crucial importance for cognitive functions (attention, abstraction, communication, memory, etc.). This result is highly relevant since no presently available medication is likely to improve cognitive functions, which play an essential role in everyone’s daily life. NAC improves the structure of the fornix and the functional connectivity of the cingulum; the fornix and the cingulum are two important connections, which link the hippocampus, responsible for the functioning of memory, with other areas of the brain. It is the first time that a treatment allows to influence connectivity. Patients in whom a “redox” blood marker, which allows to evaluate the state of oxidation in cells, has a high level of activity (synonymous with a state of high oxidation) also showed an improvement of their positive symptoms (hallucinations, confusion, incoherent behaviour) following treatment with NAC. For the first time, the last observation paves the way for a “biomarker-guided treatment” in psychiatry, in other words for a personalized treatment whose efficiency can be determined on the basis of a biological marker.